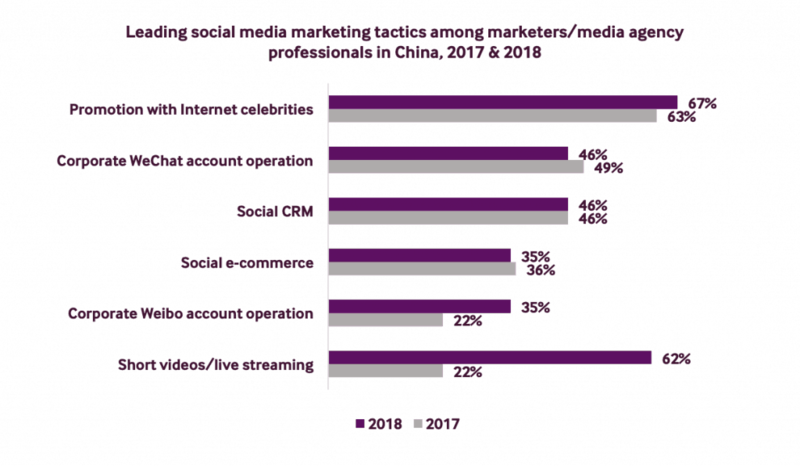 The new year is well underway, and with that we’d like to share our opinions on what we think the biggest trends for digital marketing in China in 2019. Chinese social media changes rapidly, and this year is no different. With multiple platforms boasting user bases in the hundreds of millions, it’s becoming more and more difficult for brands to formulate their marketing strategies for China. Tik Tok, which only launched in 2016 and now boasts over 500 million monthly active users, is an example of how fast the landscape can change. In this article we’ll cover a few of the top China digital marketing trends that took shape in 2018 and will likely continue to make an impact in 2019. In the last 10 years China underwent massive geographical changes, the most noticeable being the scale of urbanization & population growth in 1st tier cities. These massive metropolises were the primary drivers of growth for the Chinese economy in the last decade, but experts predict the new drivers of economic growth will be the 3rd and 4th tier cities scattered throughout China. With some of these cities’ populations rivaling those of some European countries, they’ve naturally become targets for international brands hoping to expand their business. 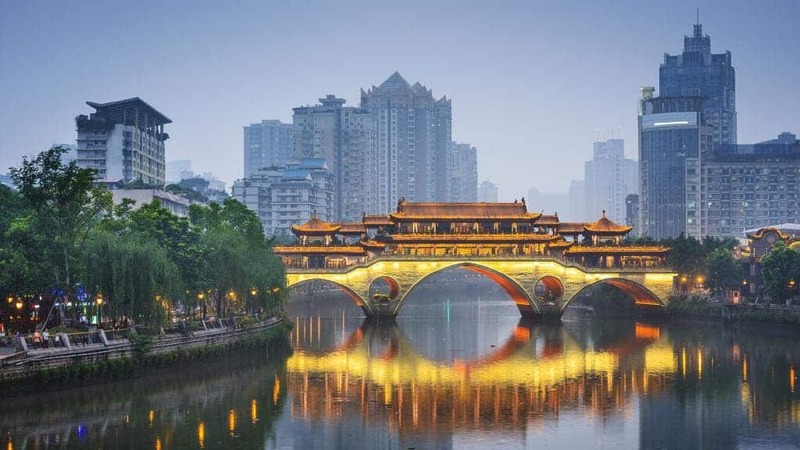 Cities like Chengdu, Hefei, Wuhan, and other massive cities have experienced tremendous GDP growth in the last few years, resulting in populations with higher disposable income and desires for higher-tier goods and services. All told lower tier cities in China make up about 59% of China’s total GDP and 73% of its total population, with further growth in both areas to expected in the coming years. In a bluepaper written by Morgan Stanley, it’s predicted that China’s private consumption could increase from 4.4 trillion to 9.7 trillion by 2030, with growth coming primarily from these lower tier cities. One of the key indicators for the growing importance of lower-tier cities is the rate of population growth in first-tier cities. Due to government initiatives and rising costs of living population growth has been slowing dramatically in recent years, with Shanghai actually shrinking since 2015. While urbanization is expected to continue it will likely see it’s greatest growth in lower tier cities. 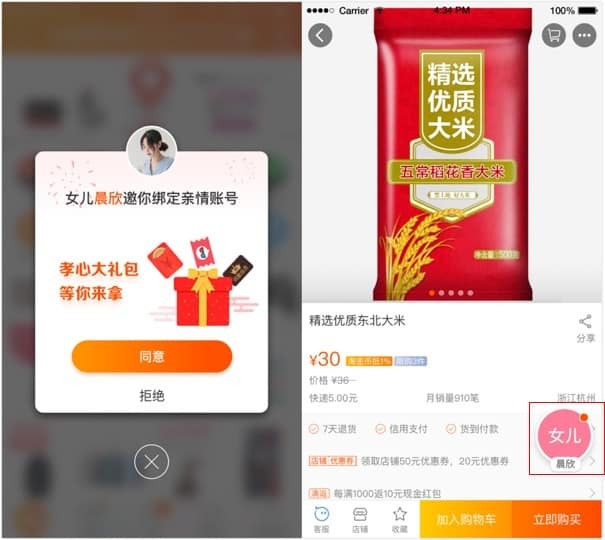 One company that’s truly shown the value of targeting lower tier cities is the now #2 most popular e-commerce app in China, Pinduoduo. Pinduoduo is an e-commerce platform that offers group buy offers and bargaining built into its platform. By strategically avoiding 1st tier cities to avoid competition with JD.com and Taobao Pinduoduo was able to build itself into a platform with over 385 million monthly active users in just 3 years. Utilizing platforms like Pinduoduo and other platforms popular in these lower tier cities can make all the difference in helping your company establish a foothold in China. All this data clearly points to the fact that investing in marketing to lower-tier cities will be a good investment both in 2019 and beyond. For more detailed information check out the report released by Morgan Stanley here. Economists and Politicians alike have talked about China’s demographic problems, but it isn’t all bad news. Recently the Chinese government has introduced new measures to bring its older citizens into the digital age! As of April 2018, only 10% of internet users were over the age of 50, but with these new programs and experienced internet users entering their golden years, it is expected that this number will steadily increase. In January 2018, Alibaba’s Taobao even launched a new channel on its platform targeted specifically to seniors, with features designed to make it easier to use. The channel allowed users to link their accounts with those of their children/spouses, share purchases/items in group chats, and make payments for each other with the “pay-for-me” option. Here we see the interface for an elderly Taobao user. You can see in the screen on the right has a button to contact the user’s daughter for assistance since their accounts have been linked. Providing value that improves the lives of seniors has the potential to fuel business growth. Alibaba’s “new retail” initiatives and JD.com’s proposed drone delivery systems come to mind with this goal in mind. Alibaba has even begun hiring seniors to consult on how to improve the user experience for seniors across their various products. The amount of elderly smartphone users has already increased dramatically in recent years with the introduction of mobile payments and various other features that can increase the quality of life in China. WeChat reports that it saw its users between the ages of 55-70 grow from around 8 million to over 50 million during 2017. 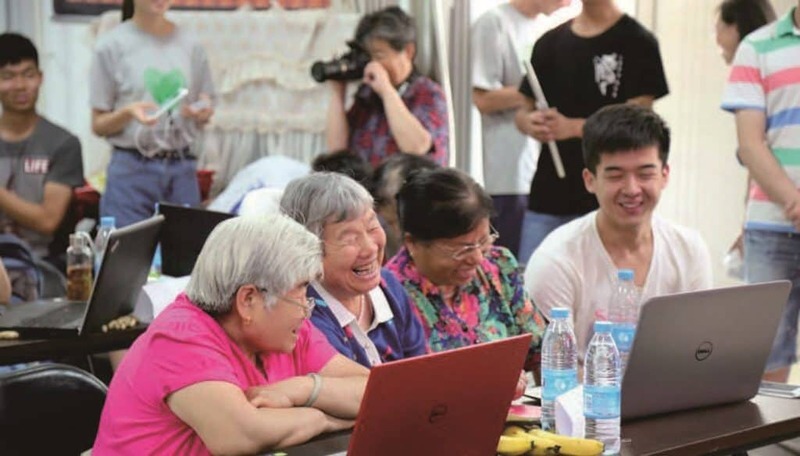 NGOs like the See Young Volunteer Service Center host training courses throughout China for the Elderly. The amount of features offered through platforms like WeChat catered towards the elderly are already quite staggering. The Nikkei Asian Review interviewed one Shanghai man who reported that not only does he use the payment features offered by WeChat, but he also schedules hospital visits and vacations through the app. 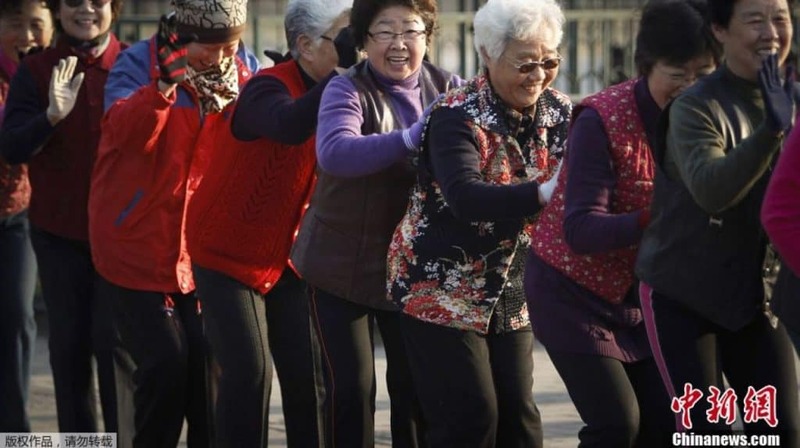 Another early mover in the industry was an app called Tangdou, an app that focuses on connecting middle-aged/elderly women who like to dance in public squares with other like-minded individuals. (According to Crunchbase this app already raised USD $32 Million, why didn’t I think of this). Tangdou also provides dance lessons and other features for its users. Quaker Oats recently partnered with the app to introduce its healthy breakfast cereals to the elderly. Placing advertisements on apps like these is a great example of how digital marketers can tap into this emerging “silver economy” in China. Tangdou connects dancers like these on the platform and provides instructional videos for users. Tapping into the Chinese “Silver-Economy” is one China digital marketing trend we expect to see both international and domestic brands taking advantage of in 2019. While this trend began in 2018, we are confident it will continue well into 2019 and beyond. Live-streaming was the initially expected to become the dominant form of content for brands in China in early 2018, but users have quickly shown their preferences for short video content. 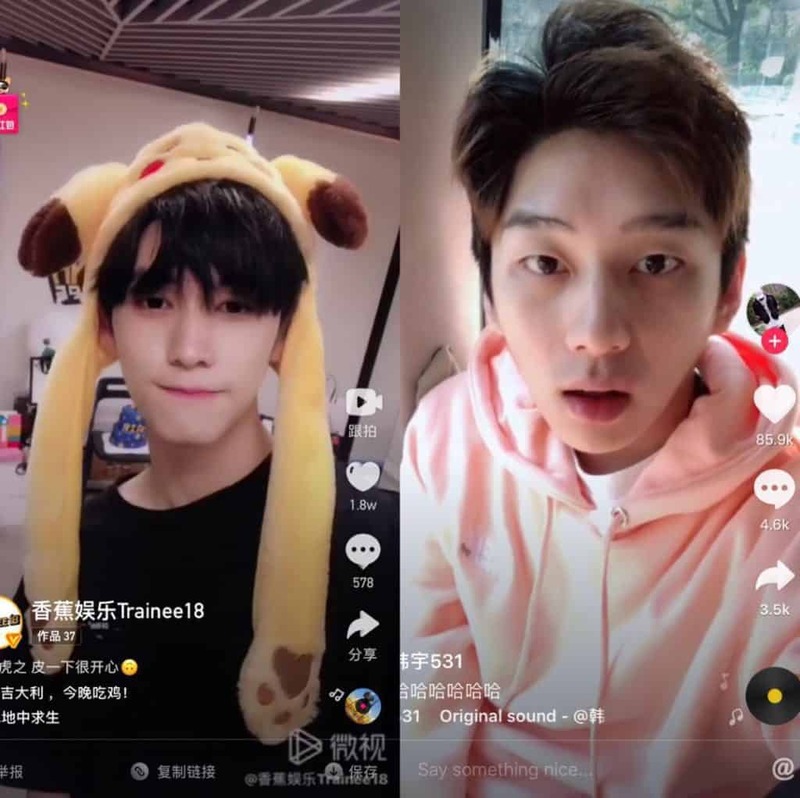 Short-videos have become all the rage in China, with a multitude of apps focusing on this particular form of content including Douyin (Tik Tok), Meipai, Kuaishou, and Quanmin K Ge. Douyin was the most popular of these with a user base of over 500 million and users spending an average of 52 minutes per day on the platform. Short-video content is expected to drastically change the way users consume content. 2017 & 2018 were the first years that marketers began taking advantage of this. Users report that this popularity is due to their increasingly fragmented lifestyles, where they only have time to engage with bite size pieces of content. With no slowdown in site, we predict that short-video content will become the dominant form of content for big and small brands alike. To show the growing importance of short-video we only need to look at the numbers. In a survey compiled by PHD Media China only 22% of marketers responded that short-video was used in 2017, while the number rocketed up to 62% in 2018. So what does this mean for marketers? It’s likely that text & picture based content might become less of a priority with the dominance of this new form of content. However, there are few things to consider when trying to take advantage of this trend. First off, short-video content isn’t easy to create, especially for advertising purposes. Trying to fit a brand message into a 15 second video that’s also entertaining enough that users could share it can be incredibly difficult. Content needs to be short enough to hold a users attention and still make a point. However, this challenge also creates a significant opportunity for more creative marketers. Short video content is difficult to produce, but as the sector matures we’ll see more and more marketers figuring it out. KOLs remain an important part of marketing when it comes to short videos. While having them involved with the content production itself can be effective, even just having them share your content can result in a drastically larger audience, which can lead to the content going viral. Engagement with ongoing trends can also be incredibly effective. Douyin for example posts daily challenges for users to engage with that the platform then promotes to other users through its recommendation algorithm. Participating in these challenges can be a great way to reach a huge amount of users with little cost. The government has been cracking down on short-video content. Many of the companies in the sector have already received stern warnings from government officials to self-censor. It’s likely that the government will take further steps to manage these platforms going forward. Stay abreast of government regulation to ensure you don’t face any setbacks in this new area. This will likely be the biggest China digital marketing trend in 2019. We look forward to seeing how brands take advantage of this new form of content. Almost all marketers have made use of some form of digital advertisement and know the important role it plays. Digital marketing in China is on track to have an outstanding growth year (yay for us!). 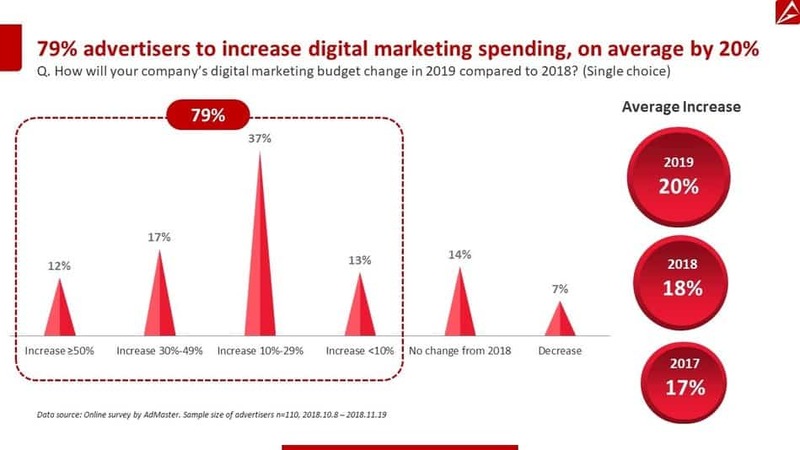 In a study conducted by Admaster, in which they spoke to 110 advertisers and 130 digital marketing professionals, 79% of companies advertisers said they intended to increase their digital marketing budgets in 2019. All this comes despite economic headwinds and a range of other issues facing the Chinese market. In its biannual report, the China Internet Network Information Center (CNNIC), found that there were 800 million internet users in China as of August 2018, with 98% accessing the internet through mobile.Unfortunately the English version of the latest CNNIC’s report hasn’t been released yet, but you can see some of their other reports here. This explains why 81% of advertisers stated that they would specifically increase their ad spends on mobile as compared to 11% for PC. 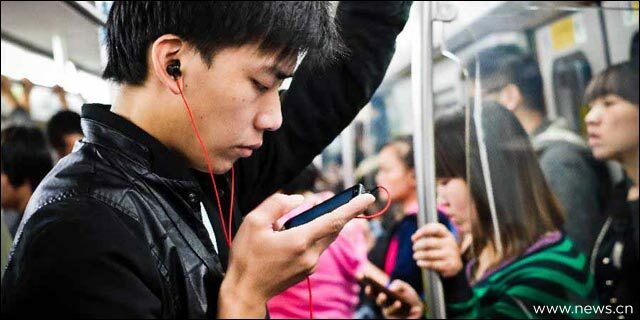 According to China Internet Watch, mobile advertising accounted for 70% of China’s online advertising market and is expected to increase to 77.8% in 2019. This a trend that seems to be worldwide as seen in a study conducted by John Lincoln of Ignite Visibility that you can see here. Spends on native ads also increased dramatically in 2018 to make up nearly 50% of China’s total online advertising market. 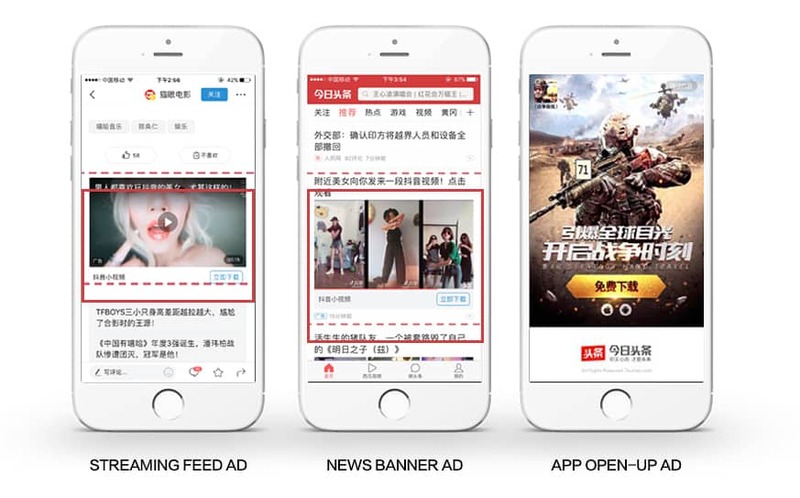 While this is spread across a range of channels it shows the development of China’s internet platform and their increasingly powerful native advertising features. Those surveyed also said they planned to increase spending on both social media marketing and content production. With average spends on social media increasing by an average of 21% each year, it’s only natural that advertisers felt they would need to increase their budgets as well, with 89% of respondents stating that they would spend more in 2019. With the rise of the short-video platform it’s also not surprising to see that over 38% of respondents said that they intended to invest in creating original videos/short films. With all this increased spending the Chinese digital marketing landscape is likely to get more and more competitive. This one took me kind of by surprise considering the popularity of bite-sized content in China. This could be seen with the rise of Douyin and the dominance of short-videos we talked about above. However, in the text & image based world it seems that long form content has been trending. One example of this was shown in one of Adage’s recent articles where they featured an advertisement created by McDonald’s. In this absolutely massive ad (152 inch), users were treated to a story about explorers who landed on what appeared to be a foreign planet. Users followed their story and were presented with educational content as the explorers traversed the volcanic planet. Finally near the end of the story came the big reveal, the fiery planet we had seen our explorers land on was not a planet, but a McDonald’s Chicken Wing. You can see the full-length ad here (click the green button in Chinese after clicking the link). The final scene before the big reveal! Misdirectional content might be one of the most interest China digital marketing trends. Frederic Raillard, co-founder of Fred & Farid, calls this form of content “misdirectional content.” Where users create content that often has nothing to do with a brand or what it’s selling, but instead focuses on delivering a highly interesting story. 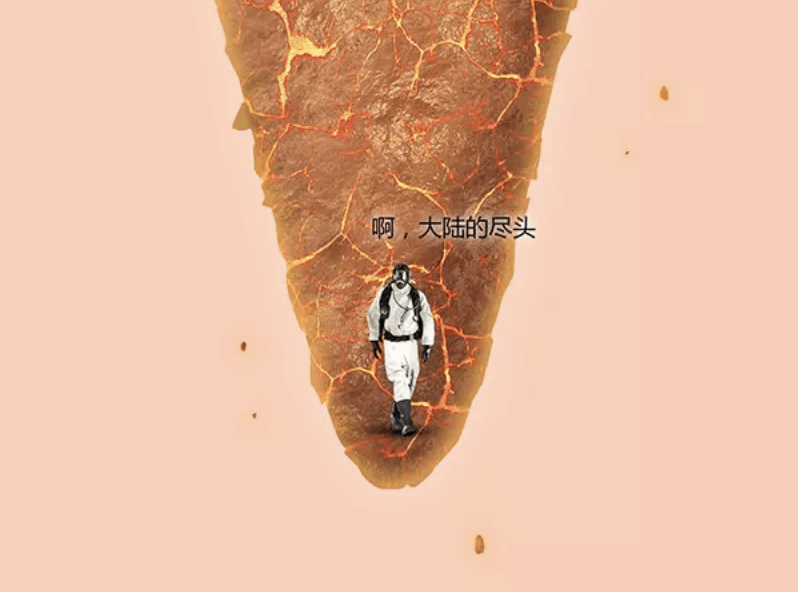 This type of content has been trending on Chinese social media, with many brands experiment with this new format. 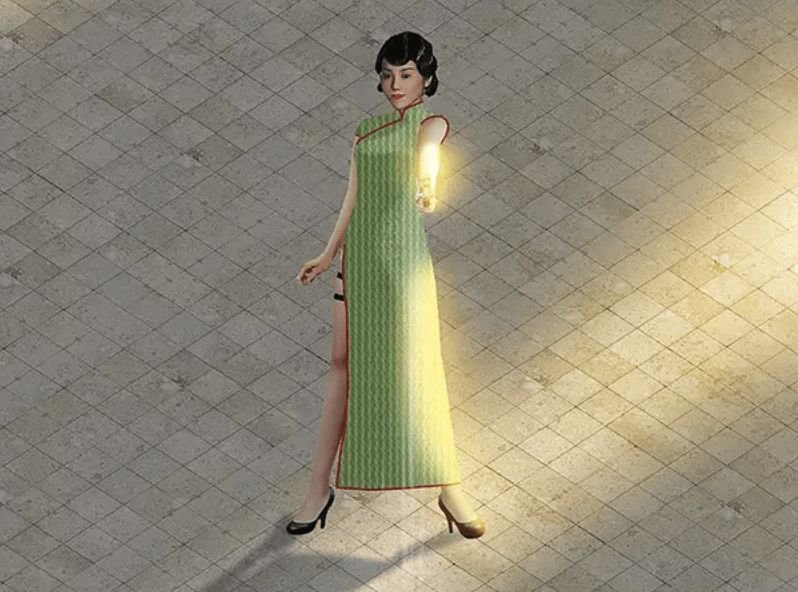 Angela Doland showcases one more example in her article on Adage, where a Chinese skincare brand Pechoin, used an incredibly long series of comics to tell the story of an assassin in Shanghai during the 1930s. At the end of the comic the big reveal that the assassin’s target was the passage of time & the aging process, something Pechoin’s products are designed to prevent. You can see the ad here. The Assassin strikes before the big reveal! Honestly, I think this content is amazing, and hope the rest of the world takes note. This type of advertising, while costly to produce, is incredibly memorable and gives content creators a lot of freedom to create something powerful. I’d like to see more of this in the future. Of all the China digital marketing trends I’d have to say this is my favorite! Tony DeGennaro is an American in Asia for the last 4 years who’s gone from teaching English in Beijing to an MBA degree from the Chinese University of Hong Kong. Social media marketing enthusiast striving to help companies expand their reach to the China market. Originally published on Dragon Social, which offers social media marketing services to international companies, and help brands expand to China.